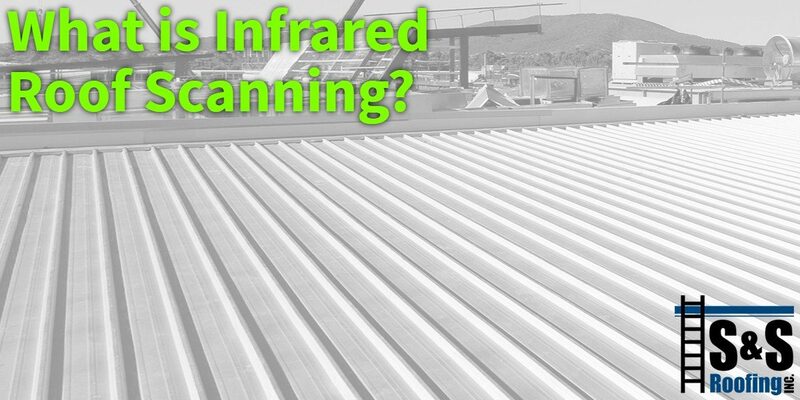 What is Infrared Roof Scanning? Businesses grow and expand, often outgrowing their current facilities. When you’re looking for a new location, you have a couple of options. You can buy land and build a custom facility from the ground up, or you can look for an existing building that meets your needs and can accommodate your expansion. If you’re building a new structure, the experts at S & S Roofing can install the perfect roof for your building, and if you’re buying an existing building, we can inspect the roof for hidden damage. Since most commercial roofs are flat, water can easily become trapped in the material, especially when there is inadequate drainage. Often, the water damage occurs so slowly that the exterior of the roof looks undamaged. The best way to identify trapped moisture is with an infrared roof scan which uses a thermal imaging camera to detect areas of trapped moisture. During the day, the sun heats the surface of the roof. At night, the ambient temperature of the roof will drop, but areas of high moisture content tend to retain more heat and cool off more slowly. Thermal imaging cameras detect temperature variations on the surface of the roof, revealing any areas with trapped moisture. The test must be done at night in order to receive accurate readings. Replacing an entire commercial roofing system can be prohibitively expensive and hidden damage can make what seems like a good investment more of a headache than it’s worth. Getting an infrared roof scan before you decide to purchase a building will help you assess the extent of any hidden water damage. Don’t make a decision just because the roof looks sound. Contact S & S Roofing today to schedule an inspection and an infrared roof scan!